View Current Cost ― User can be set to see current cost. This setting applies to seeing them in sales orders as well. View Average Cost ― User can be set to see all average cost. This setting applies to seeing them in sales orders as well. View Standard Cost ― User can be set to see all standard cost. This setting applies to seeing them in sales orders as well. See Sell Prices ― If unchecked, the user cannot see the sell prices in inventory or on sales orders. Show Inactive Inventory ― Inactive inventory is shown on inventory list. If not set then it is hidden from view. 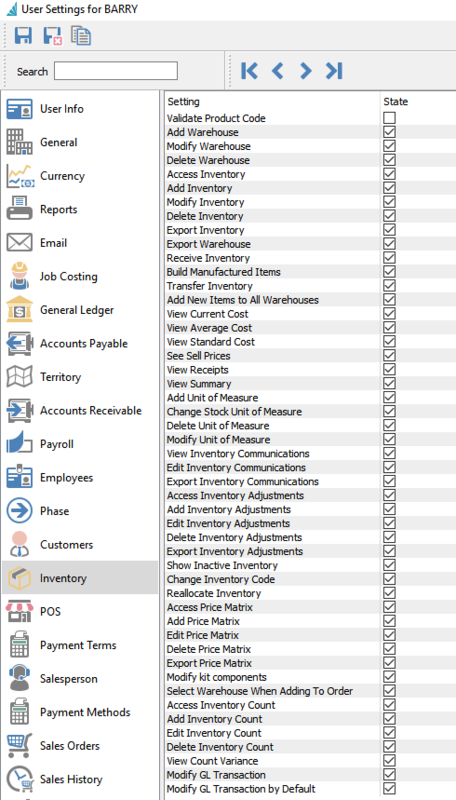 Change Inventory Code ― Gives access to the user to change inventory codes using the utility under the top toolbar Inventory/Inventory Code Change. Reallocate Inventory ― this allows user to reset the committed, back ordered and on order quantities for items that are not correct. Mainly this is only required after a new migration from other software.